Milan has some amazing food, it has always been one of the most afluent cities in the country and it’s food colour reflects this with rich dishes. I’d been to Milan once before in November. Because my partner was working, and the cold, there was little al fresca dinning. This trip however we took full advantage of the weather and dinned out doors very often. 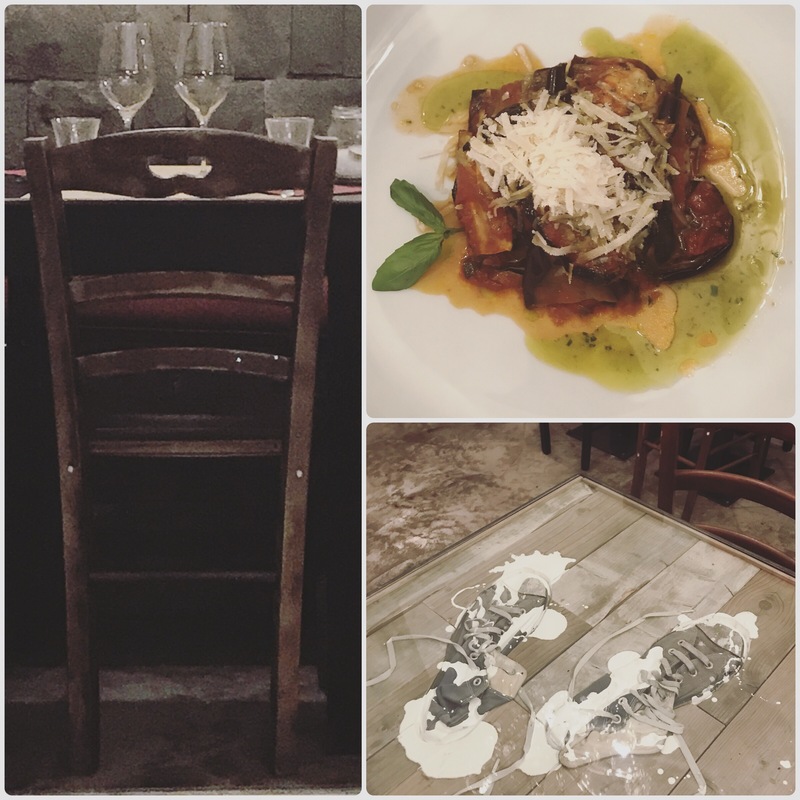 My absolute favorite dinning experience in Milan is Trattoria da Abele Temparanza. We’d found int on our last trip and it was so good we’d placed our booking, for the night after we arrived, months before shortly after booking our plan tickets! Their menu is delicious and seasonal home cooked meals you’d expect to be cooked by someones Italian grandma; you can feel the love and see attention to details, and taste the quality in everything they serve. Although we only spent 3 days and 2 nights in Milan we ate a lot of food! Especially at the wedding of my friend Laura we were there to attend. After a beautiful intimate ceremony in the garden of a castle, we were served cocktails and large buffet of snacks and appetisers, a three course dinner with wine, a candy buffet, wedding cake along with a chocolate fountain and entire dessert buffet full of cakes, pastry, fruit, and cheeses. After the wedding we headed to Rome by train to celebrate our own 4th Wedding Anniversary(June 6th). Giolitti, was founded in1890 is the oldest ice cream parlour in Rome. They’re well known for their huge selection of ice cream and gelato flavours. The inside of this place is just beautiful with it’s old fashioned marble counters espresso machines, and glass cases filled with tradtional pastries, worth a visit even if you don’t like ice cream. Della Palma has more of a kitsch retro vibe. Selling a wide range of candy and confections they offer 150+ flavours of gelato, ice cream, frozen yogurt, sherbert, and WHIPPED ice cream to chose from. I had Tiramisu WHIPPED ice cream and a scoop of Peanut Brittle with Marshmallow Ripple. Finally Frigidarium, a smaller selection compared to the previous two recommendations but what’s on offer is absolutely amazing. I had a scoop of both their raspberry and peach gelato and they were to die for. 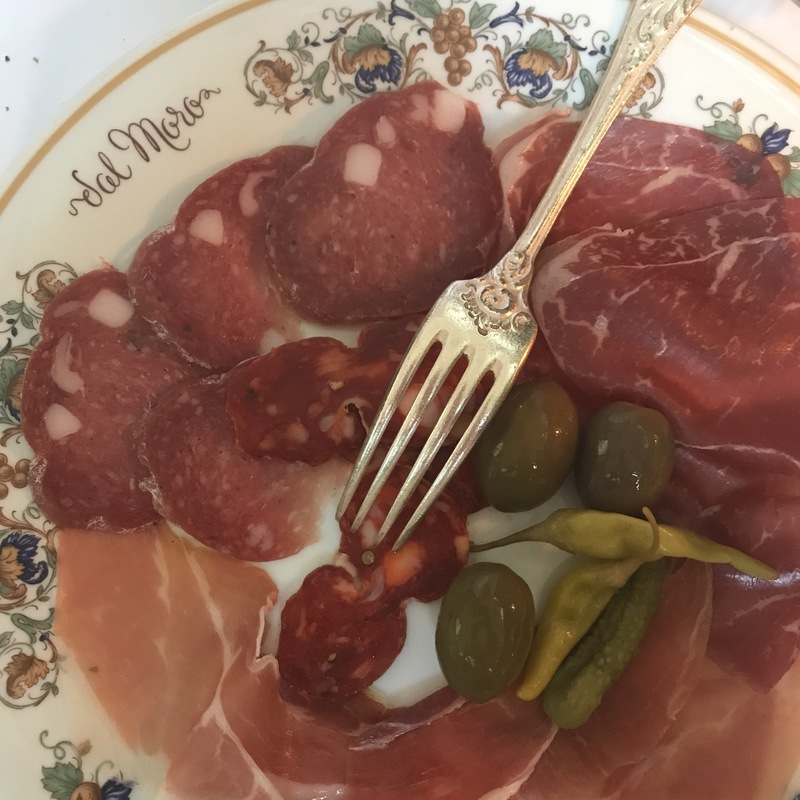 Highlights were our ‘Anniversary Dinner’ at Trattoria Al Moro; ‘a high-end, 1920s wood-paneled, romantic restaurant with a classic Roman menu & a large wine list’. I can highly recommend this spot, we chose to dine outside, which was a little loud as it’s right on busy pedestrian street, but there’s thick greenery surrounding the dining area which provides privacy. We had the most adorable old waiter who was very attentive and gave great recommendations from the menu and wine list. Trattoria Al Morro is just around the corner from the Trevi Fountain, so besides the glowing reviews online we picked it so we could visit the fountain just before sundown and after dark. The fountain was so crowded I failed to really appreciate it’s beauty on the night, we visited again the next day and it was a little less crowded but still pretty maggoty with tourists so we didn’t stick around very long. I didn’t even get a picture, it was just so crowded. I had some of the most brilliant pizza of my life from Pinsa ‘Mpo. The restaurant is very small with only a handful of small tables outside and a bar along the back wall with a dozen stools, we stopped by in the early evening during a quieter moment and managed to get a tiny table for two on the pavement outside. We did keep it simple when it came to food this trip, but that is one of the best things about Italian food. The other great food find was Passaguai. Which I think we found thanks to the trusty Guardian(they’re a trash publication but they actually do really good food guides for Europeans cities that haven’t let me down yet so…). The Roman equivalent of a posh hipster cafe, located in a slightly damp basement it was pretty refreshing to sit in the cool atmosphere after the heat and crowds of the city. The service wasn’t great but the food was. All in all it as a brilliant trip for food. Italy may not be my favourite place in the world but when given the chance to visit I’ll go purely for the food!